Present: Bryan, Bob H., Peter C., William, Ron C., Gloria C.
Minutes of April meeting accepted. Bob H. and Peter C. have been working with the Air Cadets out of Blind River on their model building project. Both of them have thoroughly enjoyed the process to date, and fully intend to see it to the end. They have both been invited to the Annual Inspection and dinner on May 30th in appreciation of their time and efforts. A brief report and photograph will be sent to Milt Barsky (MAAC Youth Chairman) for inclusion (hopefully) in the MAAC magazine. Good job guys! George P. has been doing some investigation on possible sites: The City wants $28/hr for the Collins Hall, but we may be able to get the gym at Georges Vanier for free – George will follow up. William spoke to his broker and his ING homeowner’s policy will cover his model flying as along as it is done in “a reasonable manner”. Ron C. was told his wouldn’t cover, but after the broker spoke to the underwriter it was determined it does indeed cover him – the moral here is to be really, really sure what your coverage is, and ask questions! In the same vein, Peter is going to speak to George about building some portable bases for our flying stands so that we can get the Beamish Pit into compliance with MAAC’s safety standards and get it registered as a “certified” flying site. The Denison Road/Highway 108 site is still underwater; it looks like drainage is going to be an on-going issue, and unfortunately this site is not going to work out for us… Peter C. mentioned he has a contact at Billiton BHP who is prepared to make some inquiries on our behalf for other sites. Peter had nothing but praise for Mike A. and his crew for the recent swap shop in Sudbury. He said it was very well run and that there were lots of deals to be had. Kudos to these guys for putting on a top notch event! Ron C. mentioned that he has all the MAAC magazines from 1998 to present saved on disc. If anyone is interested in accessing this material they should contact Ron directly. The skis are off and if the weather is decent this weekend we are going to try and fly. Charge your batteries, inspect your equipment for “hangar rash” and call a friend. ‘Tis the season…. Our next meeting will be Monday, June 1st at 7 pm at the ELNOS office. Regrets: Ron C., George P.
Minutes of February meeting accepted. The issue of receiving accident reports from MAAC (so we can learn from other’s mistakes) will be brought forward at the MAAC AGM. This was brought forward to the Zone meeting, and Kevin let us know it was moving forward and is on the agenda. William spoke to MAAC about the web site. Our link should be up soon…Again, for those who don’t know, our web site address is http://nsrcm.tripod.com/index.html and Ron is always looking for new pictures, etc, to keep it current. All of the Club jackets have been picked up – now we just need the right weather to wear them! Bill G. is looking for ‘flying buddies’ to head to the lake on these nice sunny days.. get your planes charged up! We are interested in the ‘foamie movement’ but will probably wait until the fall to pursue this – we’re just too close to the outdoor flying (hopefully). DON”T FORGET TO RENEW YOUR MAAC MEMBERSHIP – IT’S REQUIRED!!! Our next meeting will be Monday, April 6th at 7 pm at the ELNOS office with George P. presiding. The issue of receiving accident reports from MAAC (so we can learn from other’s mistakes) was raised again. This was brought forward to the Zone meeting, but we haven’t heard anything further. We will check with Kevin M. to see if this got anywhere at the MAAC AGM. If you have any pictures, etc, send them to Ron and he will switch them around with what’s already on there to keep it fresh. Bill G. is going to check with K&K Embroidery to make sure all the Club jackets have been picked up, so that we can be sure they’ve all been paid for as well. 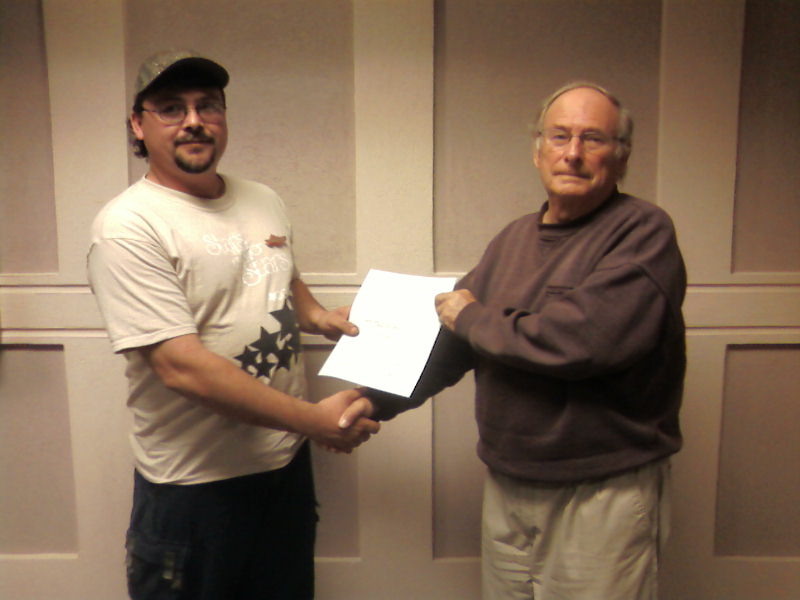 Here’s a shot of George P. getting his wings certificate from Past President Peter C. Congratulations George! Speaking of wings, several Members have been ski flying, and as the weather continues to improve we expect much more activity. Make sure you dress appropriately and call around first, so that everyone is headed to the same venue. And remember, your battery life will be greatly reduced in the cold weather! We received a kit of the model the Cadet’s are currently building. Bob H. will stay in touch with Darla Hennessy to keep this project on course, including getting them out to the field for some ‘stick time’ in the Spring. Our next meeting will be Monday, February 2nd at 7 pm at the ELNOS office. Until next time, fly safe and have a great start to the New Year! A big thank you to those who stepped forward to fill positions and to those who so ably held them in the past! The Blind River Air Cadets are requesting our help in model building and flying. They have done basic models and have moved on to free flight, with RC as their ultimate goal. They are looking at setting up a building/flying schedule for the spring. A couple of experienced Members will help guide them in the building process, with Peter a good candidate to head up that part. Bob and William agreed to look after the flying portion of the project as long as it is cleared with MAAC (we will use the Club trainer or equivalent). In the meantime, several Members are ready to go ski flying. Make sure you dress appropriately and call around first, so that everyone is headed to the same venue. And remember, your battery life will be greatly reduced in the cold weather! Our next meeting will be Monday, February 9th at 7 pm at the ELNOS office (I am away on the 2nd, sorry). Peter C. provided an overview of the Northern Zone AGM recently held in Sudbury. The event was well attended with almost every single northern club represented. Kevin McGrath was returned as Northern Zone Director – congratulations Kevin! The issue of accident reporting was raised, and will be brought forward to the ext MAAC AGM for discussion. The intent is to have a system to share information around any accidents, so that other Clubs and MAAC members can learn from it and hopefully prevent a similar occurrence. There was more discussion about flying fields… we will have another look at the 108/Denison Road site in the spring, and if is going to be a ‘dry’ site we will do some work to get it into shape (Denison has already agreed that we can use it). The club jackets are in at K&K Embroidery. Please pick yours up if you ordered one, and pay the Club for it ($45 with taxes). We received notice that the City is updating its web site and that we need to re-enter our club data. William will look after this. The site is www.cityofellotlake.com and then click Business Directory and then Clubs and Organizations. George P. was presented with his pilot’s wings and certificate – well done George! By consensus, elections were deferred until the December meeting. The offices are: President, Vice-president, Secretary/Treasurer and Safety Officer. Our next meeting will be Monday, December 1st at 7 pm at the ELNOS office. Rob T. was presented with his certificate and MAAC wings after a successful test on the weekend – excellent work Rob! Rob T. (left) receiving his wings and certificate from club President Peter C.
Peter C. will be attending this year’s MAAC AGM in Sudbury on October 11th. William will make sure any Club member not attending will have a proxy for Peter to take on their behalf. Among other things, Peter will raise the issue of accident reports being made available to all MAAC clubs, so that we know what has happened and what can be done to prevent future similar events. This is a very common practice in industry and seems to make a lot of sense for us as well. The issue of the club jackets remains unresolved – anyone interested in a club jacket ($40 all in) should let me know what their colour preference is. And while everyone will need to go by K&K Embroidery to pick the right size, the jackets will be ordered by the Club, so you will owe the Club the $40. The Club trainer has receiver problems… fortunately Bill G. has a spare radio we can use and Bob H. has compatible servos, so once Peter installs everything we should be back in business. In the same vein, William will contact Bert at the airport to find out if there is a good time for us to get out there with some youth groups (Air Cadets, Sea Cadets, Young Eagles, etc) for some “buddy box” exposure. The Club web page is in need of updating and Ron C. is requesting that members send him any pictures, articles, etc, that they think would be of value, and he will ensure they get posted. Bob H. suggested, and it was agreed, that we should start presenting a Club Certificate together with the MAAC wings to new pilots – good idea Bob! Our next meeting will be Monday, October 6th at 7 pm at the ELNOS office. Both Peter C. and Bryan attended the IMAC event held in Sudbury over the long weekend. This is a cooperative event between Sault Ste. Marie and Sudbury clubs. By all accounts this was an outstanding event. All those associated with it should be extremely proud, as their hard work and dedication resulted in a superior event. Congratulations! The Denison Road/Hwy 108 is mostly dry, but according to Rob needs work – lots of work. It will be something to consider but is obviously not in ‘move in’ condition. Don’t forget our friends at the airport – they love to see us there, and as a result of the wet summer, there are no MNR aircraft located there. There will be no “second meeting” in August. It is being put on hold until the fall.. Rob brought in samples for the Club jackets. The price is $40, all in, and consensus was to go with red (thanks Bob!). Rob will check with K&K to see if they are okay with individual orders or if they want a group order. Either way members will have to go in for sizing. George is headed south on the weekend; anyone need supplies should contact him before Sunday the 17th. Our next meeting will be Monday, September 8th at 7 pm at the ELNOS office. Welcome to Don R, recently relocated to town from the States – glad to have you aboard! The Senator site is now questionable – the asphalt piles are marching closer and closer, with o indication of when they will recede. It also seems the dog walkers may be getting their “no leash” facility there, but we haven’t heard back from the City officially yet. There is also an open field directly south of Senator, also on Pearson that has potential. The Denison Road/Hwy 108 is okay by Denison, but is still under water! I guess when we checked it out was unusually dry… too bad, it’s a great site. The gravel pit is good to go. Remember to coordinate where you are flying with other members, especially if someone needs instruction. We want to make sure everyone’s needs are looked after. Peter C. informed the members of a new protocol for electrics only being instituted by the AMA, to allow them access to school yards, etc. If MAAC adopts a similar policy it may really help us, as we have a lot of electric flyers and a lot of good potential electric only sites. The “second meeting” for July will be on Wednesday, July 16th at 7 pm at Peter’s garage. 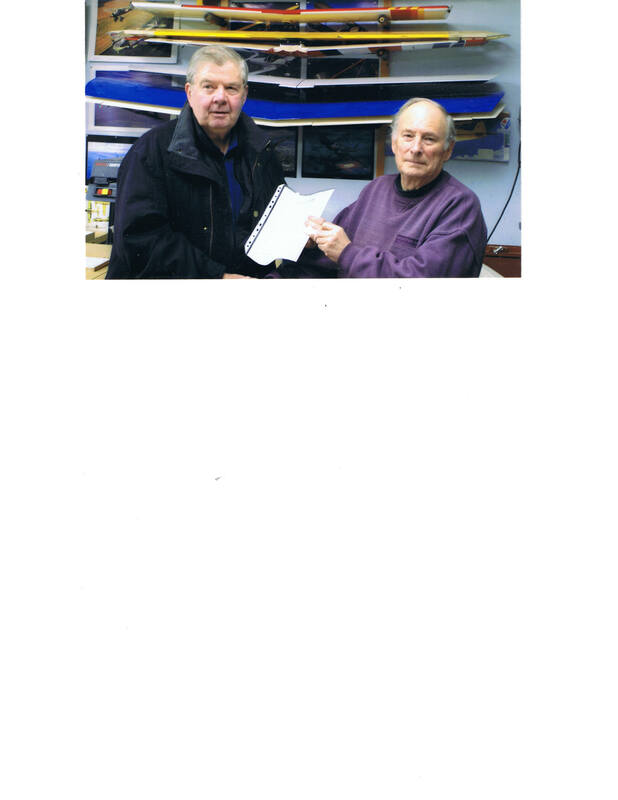 A motion was made (moved by Bob H., seconded by Ron C.) for the Club to pay for new batteries for the transmitter for the Club trainer. Carried. Peter will follow up on the potential for Club jackets. He has checked locally, but will compare with what the Sudbury guys have purchased and report back. William will be unavailable to instruct for the next 2 weeks, but thankfully Bob is feeling better, so feel free to give him a call. Anyone interested in volunteering the drag races will be sent an email if people are still needed. The races are the 18/19/20th of July with the volunteer meeting/registration taking place on the 17th. Check your email! While flying the other day, a student’s model was subjected to a somewhat violent maneuver – heavy up elevator to pull out of a dive. Right afterward, a “buzz” could be heard coming from the model that wasn’t there before. The instructor took control, throttled back, and immediately landed. Upon inspection, it was found that the horizontal stabilizer had come loose. It was being held on by covering and the control rod. Fortunately, it was easily repairable and no real damage was done; BUT, this is a reminder that no unusual noise should be ignored. A “buzz” is usually a sign of control surface flutter, and continuing to fly could result in a catastrophic failure! Check your models and be safe! Call around if you need a ride or have extra room. There are several vehicles going! Our next meeting will be Monday, August 11th at 7 pm at the ELNOS office.